Multiple scenes of Sherman County, Kansas. In the George Hayden homestead photograph pictured left to right are Tom Smith, Gertrude Bullock, Nathan Lampshire, Will Thomas, Great Grandpa Tom Bullock, Mrs. George Hayden (Mary Bullock), and Dora Thomas. Children are listed as Melder in rear, Bill on the far right, and Lee and Jim Thomas. 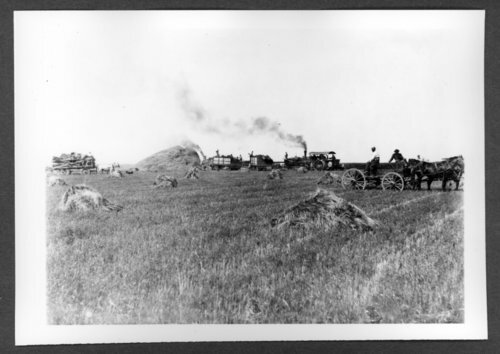 Scenes of Sherman County, Kansas - Threshing wheat owned by G.L. Calvert.